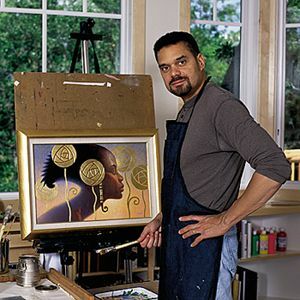 Because each of the designs in Thomas Blackshear’s Ebony Visions are a powerful expression of human experience, the line has been enthusiastically received since its June 1995 introduction. The line continues to earn many awards, including the coveted 1996 Rising Star Award, 1999 Artist of the Year Award, the 2000 Figurine of the Year award for Oh No She Didn’t and first runner up for the 2000 Artist of the Year award from the National Association of Limited Edition Dealers. Thomas was also honored with the 2001 International Collectible Artist Award which commemorates Thomas into the new International Collectible Hall of Fame. According to Willitts Designs Art Director Mary Kern, “Thomas’s incredible sense of design, eclectic artistic style and extraordinary mastery of color is demonstrated throughout the collection.” Now in its sixth year, the collection is thriving as Thomas continues to create figures that evoke memories, emotions, and resonate with meaning. The first six figurinesthat debuted in 1995 have since retired and have become highly sought-after and treasured collectibles. For the year 2000, Thomas expanded his vision further with the introduction of a new grouping within the Ebony Visions collection called The Blackshear Jamboree Parade. The sculptures are a celebration of youth, portraying children whose fanciful costumes incorporate both contemporary and traditional African design elements. Each child is playing a musical instrument or just enjoying the fun of the jamboree. Rudy Toot, was the year 2000 event-exclusive design and Kitty is the 2001 event-exclusive. Marching along in his colorful costume, Rudy Toot embodies the spirit of playfulness that resides in the heart of every child.